If you walk on any sidewalk chances are it has happened to you. Enough to instantly put you in a bad mood, the smell, the squish, the hassle of removing it from your shoe, oh your glorious shoe!! 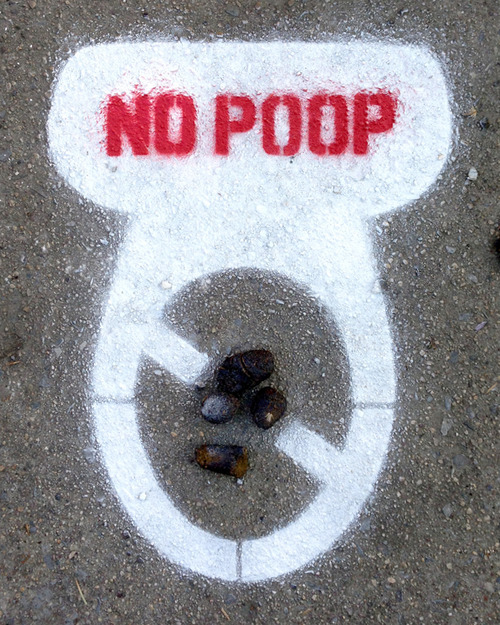 One man from Queens in the USA had enough of his communities dog owners not picking up after their pet so he decided to take it upon himself to not only forwarn pedestrians to the brown, smelly landmines but to encourage dog owners to clean up! Dressed in an oversized hoodie and glasses for disguise this superhero poop fighter will spraypaint, (with temporary chalk) over the k9 landmine to ensure nobody steps in it.